We’re sort of at a loss for how to write this post. We could approach it as your typical makeover post, complete with befores, afters, and a budget breakdown. But the room we’re sharing with you today isn’t about how dramatically it changed, how quickly it happened, or how affordable the transformation was. It’s about something much more important than any design or DIY could ever be. Which is maybe why we fear we won’t find the right words to tell you about it. A family in our community experienced the unthinkable: their son Mason passed away very suddenly last month. He was 4. He loved preschool and superheroes. His older brother Hudson, who is almost 6, was his best friend. But after falling ill with a respiratory virus, Mason passed away in his sleep. Understandably, their home had become a tough place for the Newtons to stay. 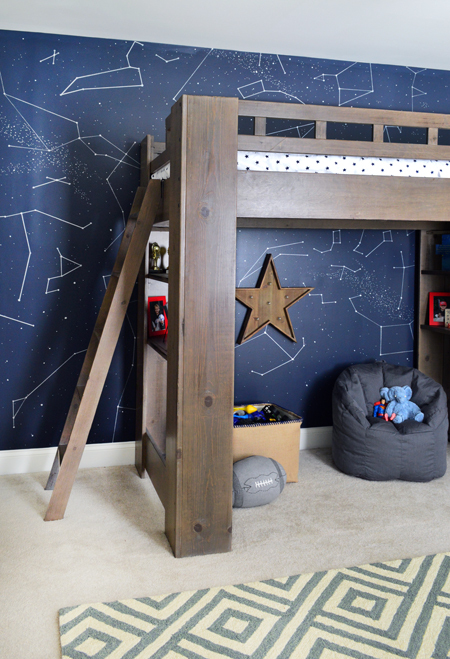 In particular, the bedroom that Mason and Hudson shared needed addressing because Hudson hadn’t felt comfortable sleeping in there anymore. 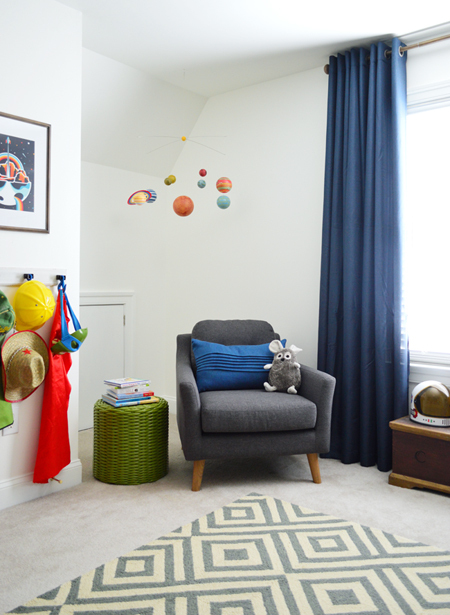 Robbie and Chrissy knew that helping their son move forward and helping everyone in the family get some much-needed rest depended on transitioning that room into a dedicated space for Hudson, as sad as that sounds. They also knew it would be a task that was too painful to do themselves. 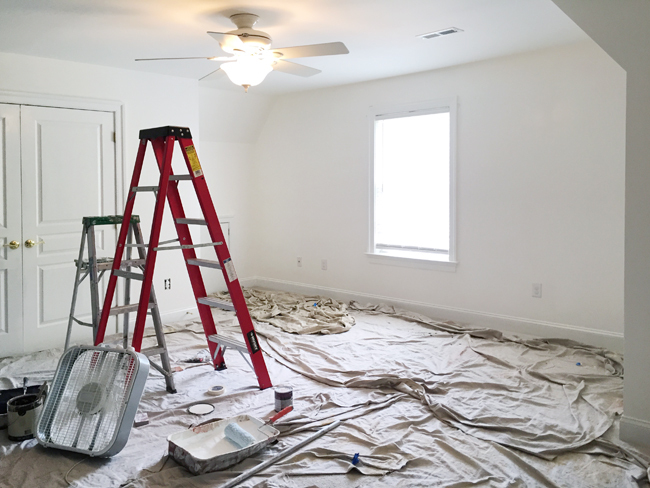 So their friends, neighbors, and members of their church swooped in to help give the house a refresh, and they called us to see if we could take on Hudson’s bedroom. I basically cry-shouted “Of course!” into the phone before we heard any of the details. We found out last Monday morning that the Newtons were leaving town that night and returning a few days later on Thursday afternoon (someone had offered up a quick stay at a beach house so they could get away). This gave us a small-but-workable window to make this happen, especially given their incredible army of supporters. So we rolled up our sleeves, cleared our schedules, and got to work. Our first step was to create our game plan thanks to lots of details about Hudson. We learned that he loves outer space, science, planets, and superheroes and the Newtons were hoping for some fresh paint, a loft bed, a comfy reading chair, and a desk. With the family away at the beach, a neighbor had lined up some painters, so we selected Benjamin Moore’s Simply White (semi-gloss on the doors and trim, flat on the ceiling, eggshell on three of the walls) and Benjamin Moore’s Hale Navy for the fourth wall to create an accent behind the bed. Our local Home Depot color matched and generously donated all of the paint when they heard about the project. Here’s what it looked like on Tuesday morning, after it had been cleared out by friends & neighbors, and the painters were working away. 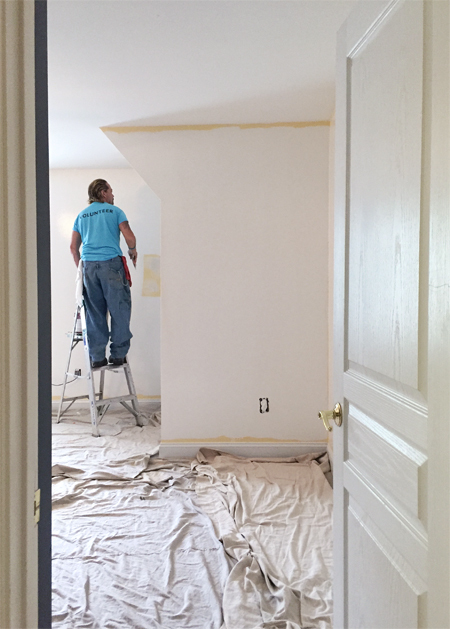 By Wednesday morning the paint was dry and the room was ready to be filled. And here’s what that wall looked like 30 hours later on Thursday afternoon, just waiting for the Newtons to come home. 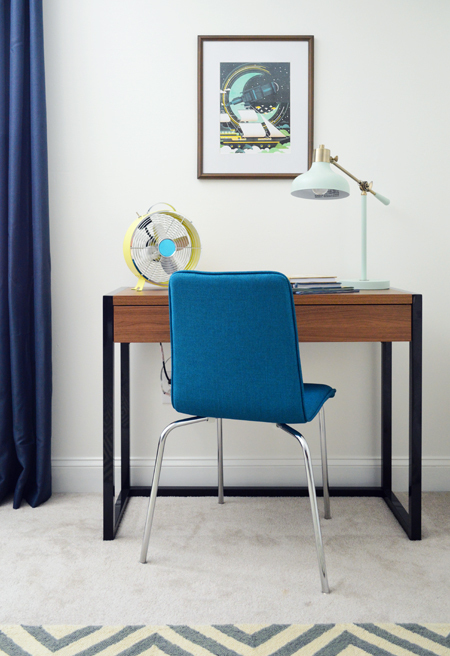 One of the biggest challenges was sourcing furniture with such a quick turnaround time. Their church had donated funds to purchase most of the new items for the room, and we pitched in some more funds to round out the budget, but we were limited to things that were available for purchase straight from a store – which meant that hunting for deals online or casually perusing craigslist & thrift stores over the course of a few weeks was out of the question. Thankfully we did have some time to call in a few favors, but more on that in a minute. Since the room was being painted on Tuesday, we spent most of that day planning and shopping. 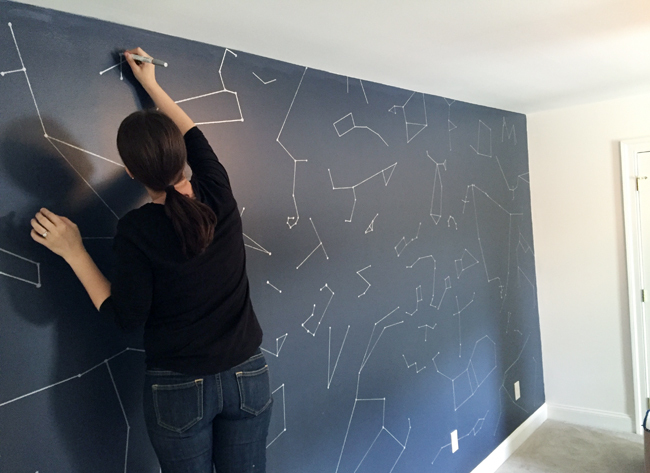 Then on Wednesday we got to dive into creating the “Constellation Wall” behind the bed, which turned out to be one of our favorite projects – both for the final results and the process. 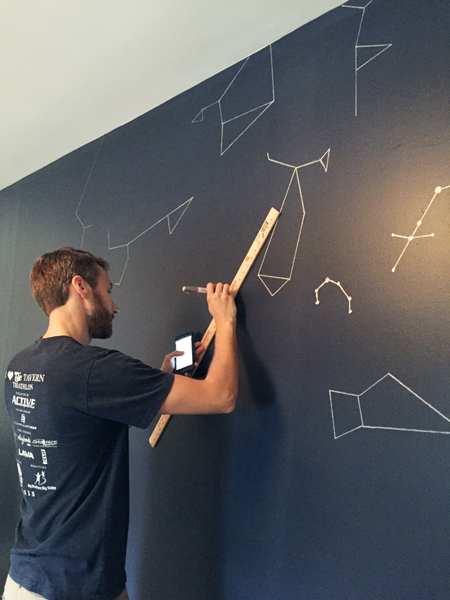 John referenced a map of the night sky on his phone as he went, while joking that nobody should take an astronomy test based on his drawings. He made the line segments with a silver Sharpie paint pen and a yard stick. We drew on our own walls with a Sharpie paint pen for a project in our second book, so we can vouch for the paint pen’s durability (and paint-over-ability for whenever Hudson outgrows it). 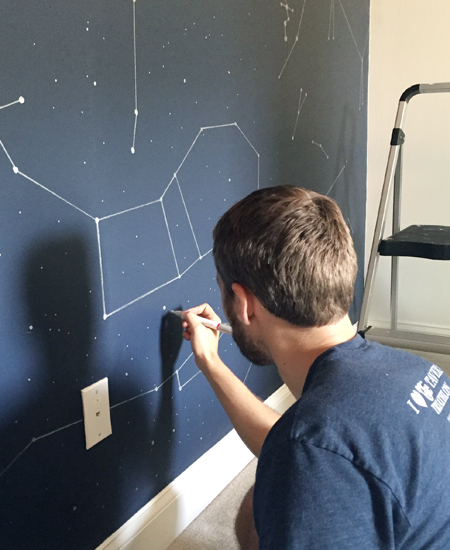 I followed behind him with a second paint pen and added circles to form the stars at any point where the lines end or meet. 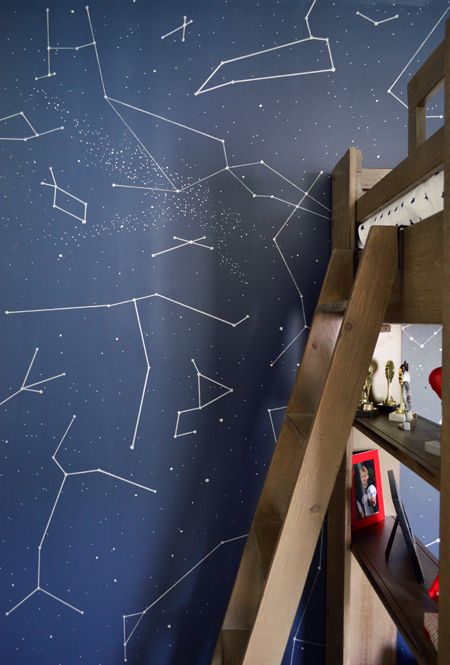 The last step was both of us going in and hitting the entire wall with more stars around and between the constellations to make it feel filled in. Working in some larger and some smaller dots gave it extra dimension, and a few clusters and swarms of dots mimicked the ones we saw on constellation maps. 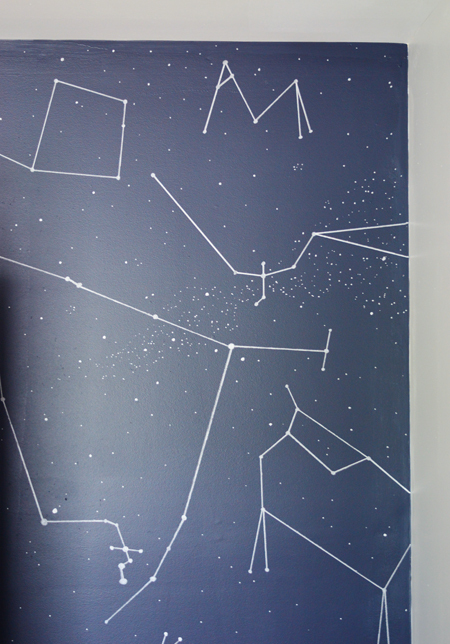 All in all, it took us about 2.5 hours to create the wall of constellations. One of our favorite parts was hiding a big H in the stars for Hudson, and an M on the other side for Mason. 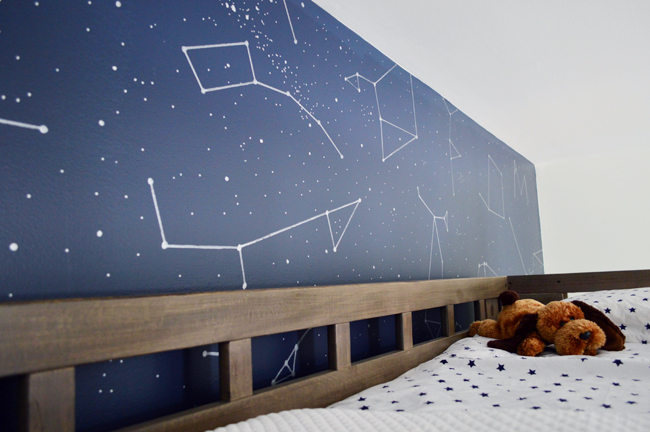 It was awesome to hear that Hudson ran in and loved his new wall – and noticed both of the hidden initials right away! The loft bed was from Rooms-to-Go Kids (since we literally needed things to go) and we were able to get it for a great price since it was a floor model. Even better, after hearing what we’d been up to, our friends at Biringer Builders pitched in enough to cover the entire cost of the bed. 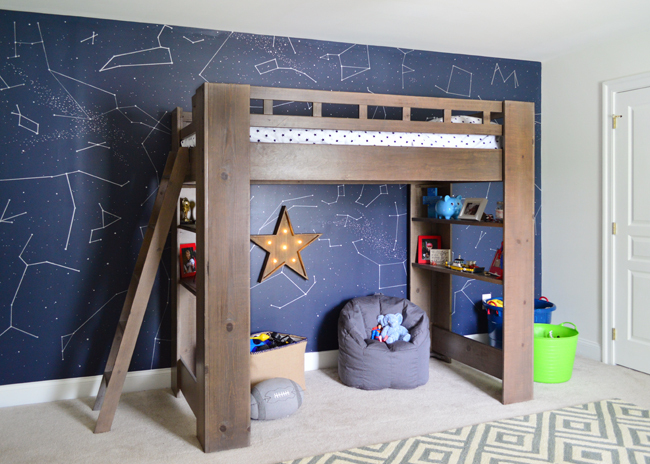 It was such a lucky find, because we knew Hudson had really wanted a loft bed (and most of them seemed to be out of stock or “order only” in our area, meaning they’d take weeks to come in). The star bedding is from Pottery Barn Kids, and after debating a duvet and a big fluffy comforter, we opted just to fold a white quilt at the foot of the bed for simplicity (we learned firsthand that making a loft bed can be a little tricky). We originally planned to put a desk under the bed, but decided that a bean bag and some toy baskets created more of a casual play space/hideout (although the desk that we bought fits under there if the Newtons ever want to move it). Oh, and the star marquee is battery operated – so three cheers for no visible cords. 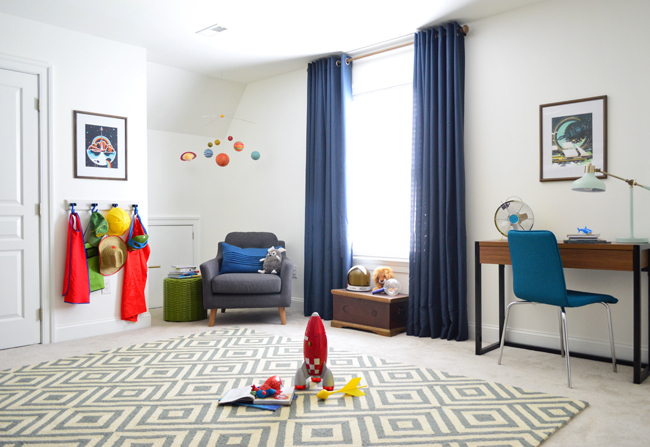 The 8 x 10′ rug was a HomeGoods find, and it was actually an 11th hour switch. We had originally found a similar one that was green & navy, but after seeing things come together it was waaaaay too demanding. So we made the exchange for this one, which layered in a lot more easily in the big, open play space. Since the Newtons use the double-doored closet for clothes, they didn’t need a dresser, but they did ask for a desk, and this wood & metal one fit nicely next to the window. Adding a blue fabric chair and a soft green desk lamp from Target along with a colorful fan & navy curtains from HomeGoods tied in the colors in the artwork. 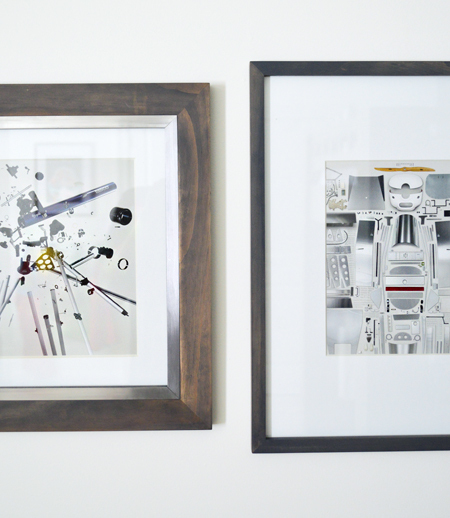 Speaking of the art, that’s a Help Ink print that we popped into a simple wood frame. 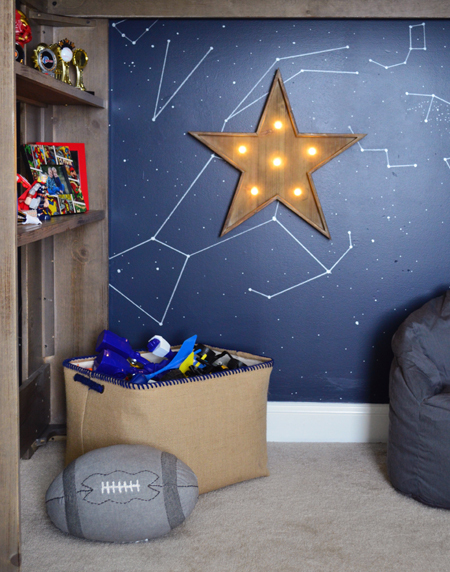 We’ve had it for a while and knew immediately when we heard that Hudson loves space and exploring that we had to find a spot for it in his room. 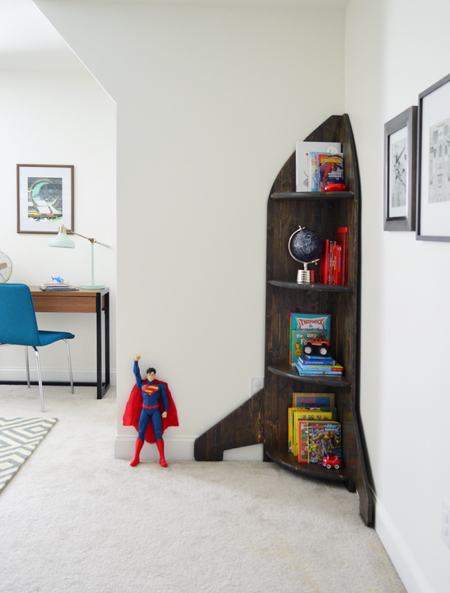 Just beyond the desk, tucked in the corner that you see when you enter the room is one of our favorite pieces: the rocket ship shelf, or rocketshelf, as we lovingly dubbed it. Jesse and Tyler, some friends of the Newtons, wanted to contribute their carpentry skills to the room and they whipped this up late one night based on a photo we found on Pinterest. It’s like we blinked our eyes and it was done. It was amazing. The stain color is one coat of Minwax Jacobean followed by one coat of Mixwax Classic Gray, which we picked to relate to the various other dark finishes in the room like some of the frames and the dark desk legs. The frames you can see along the right wall are pages John cut out of one of his favorite books – Things Come Apart. It’s filled with nerd-tastic pictures of machines and technology that have been taken apart and photographed. When John heard that Hudson loves science/space/experiments, he immediately grabbed the book and we chose two photos of a telescope (one with the pieces meticulously organized in a grid and the other with the parts beautifully exploded across the page) along with a third image of a deconstructed model airplane that we hung between them (to remove each page we just ran a craft knife along the spine and popped them into two of these frames and one of these frames). John and Hudson’s dad had a great time talking about them, and they even sparked him to run downstairs and bring up Hudson’s telescope. Back in the reading corner, we were able to anchor it with this super comfortable gray chair that LaDiff (an awesome local furniture company) donated when we told them about this project for the Newtons. They actually offered up our choice of three chairs, so I went all Goldilocks in their showroom and declared this one juuuuust right after sitting (and re-sitting) in all three. 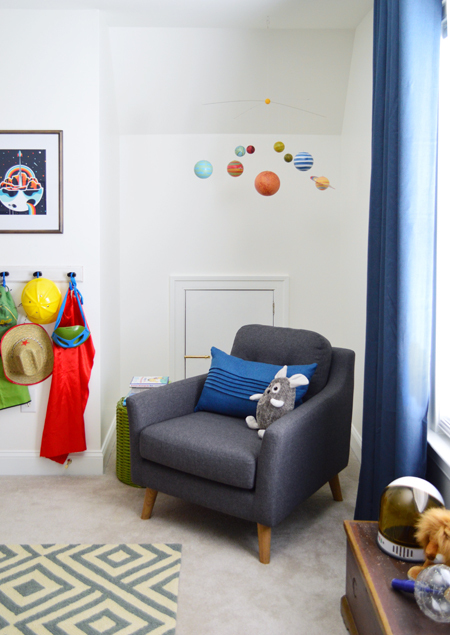 The solar system mobile is another Pottery Barn Kids find, which instantly perked up that recessed nook while adding some good color (and planets!) to the space. Pun intended. 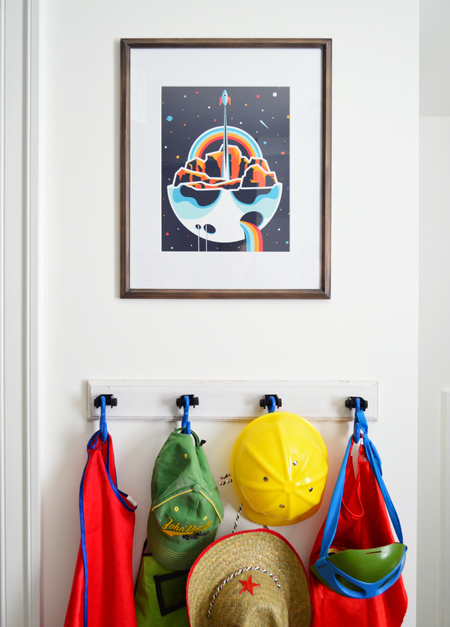 Hudson and Mason had lots of dress-up stuff (Mason wore superhero costumes to church almost every week) so we added this cool hook rail (a HomeGoods find) on the little slice of wall next to the closet. Above it hangs another Help Ink print, which they generously donated (and overnight shipped!) specifically for this project. They’re all around good people (they donate $1 for every $5 spent on their site) and I almost can’t believe how perfectly their prints fit into this room. Since the Newtons said they never used the old ceiling fan (and a lofted bed + spinning blades made us nervous!) we switched it out for a ceiling-mounted shade pendant light that we recently designed with Shades of Light, which they kindly donated. It has two bulbs for plenty of light, and we made sure they were LEDs so the Newtons won’t have to worry about replacing them anytime soon. That pretty much covers the things that went into the room, but again, that’s not really what this makeover was about for us. It was really the effort, selflessness, and love of all the friends, family, and neighbors that made such an impression on us. We should all be so lucky to have people in our lives that will be there when we need it most. So please indulge me as we take a second to thank Jenn, Jamie, Jesse, Tyler, Matt, Joe, Stephanie, Crystal, Emily, Kristin, Laura, and many many others who helped us clear the room, organize the closet, and assisted me as I wrestled a particularly defiant bunkie board into place while John took an un-reschedule-able conference call from the car (aka, his “mobile office”). And one more big thanks to everyone who donated to the project: La Diff, Biringer Builders, Shades of Light, Help Ink, Journey Christian Church, and even my mom, who happened to be in town and slipped money into my pocket mid-hug as I told her why she and the kids would be getting lots of quality time together while we ran around. When the Newton family pulled into their driveway last Thursday evening, we gathered outside along with friends and neighbors to welcome them – but we stayed outside so they could take in their “refreshed” home as a family. 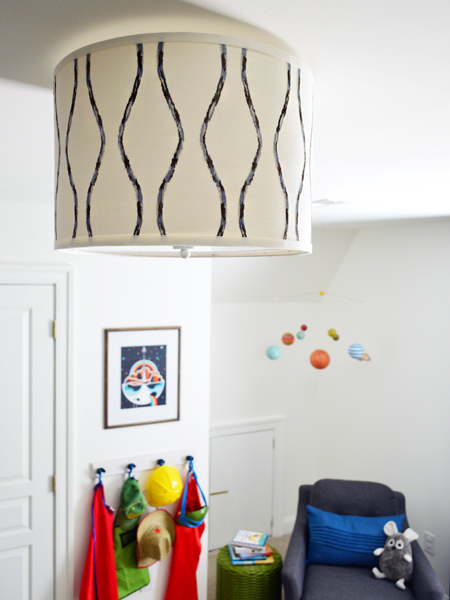 In addition to Hudson’s bedroom, there were lots of other updates and organization that friends and relatives had tackled on the first floor, in the garage, and in the hall bathroom. After a little while we were invited in to introduce ourselves, spend some time with everyone, exchange some hugs and some tears, and tell the Newtons how grateful we were to be involved. Getting a big hug from Hudson and watching him play up in the loft bed with his friends was the highlight of the evening. Cue all of the feelings. Psst – If you’d like to help this family in some way, they’re graciously donating all of the money they raise in a GoFundMe account towards a new play area/preschool for their church that will be created in Mason’s honor. I can’t think of a nicer family to lift up with love and kindness. *This post contains affiliate links, and any earnings they generate will be donated to the Newtons.